What!? Already? Wasn’t there just a Fan Expo Vancouver last fall? That’s right! But it’s back so soon with its new spring schedule! Where can you find me and all of Peter Chiykowski’s sweet Rock, Paper, Cynic loot? Come on by for t-shirts, books, postcards, more books, and dice towers. My booth buddy Terry and I will be intermittently playing a D&D side-quest adventure for his Half-Orc Mii Grawp, so you can join us and roll some dice (or make questionable decisions) for his character. Me Grawp! Err… Me, Mii Grawp. The guests are pretty killer for this Fan Expo as well, and–hearkening back to my year of haiku–I wrote some poems for them! That’s it for my Fan Expo hype post! 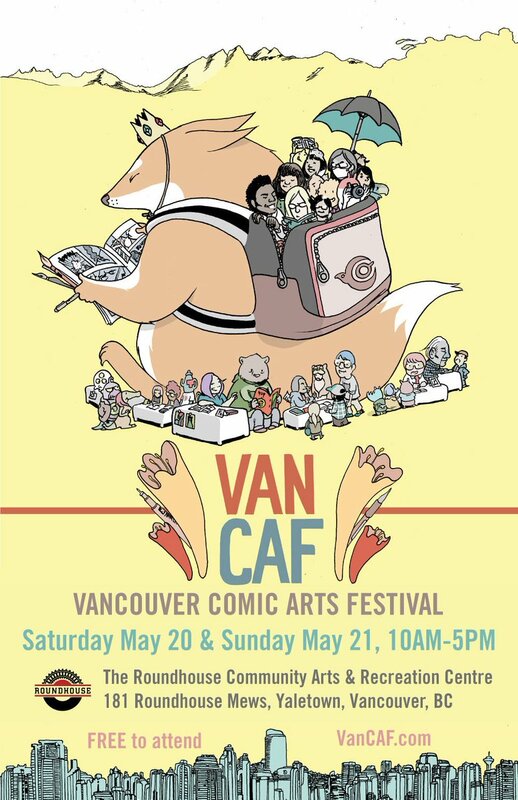 Hope to see you at the Vancouver Convention Centre this weekend! Hello! Sorry I’ve been MIA for a while. I’ve been working on some exciting collaborative projects that will hopefully be ready for your viewing pleasure soon. Until then, allow me to recommend the work of some comic artists whom I adore! If you’re in Vancouver today, head to Yaletown Roundhouse and check out the spots marked on the treasure map below. If you’re not in Vancouver, check out their websites. I’m sure you’ll enjoy their work as much as I do!